In the new Swift language from Apple, how does one call Objective-C code? Apple mentioned that they could co-exist in one application, but does this mean that one could technically re-use old classes made in Objective-C whilst building new classes in Swift? Objective-C is a platform-independent language, whereas Swift is platform-dependent. Writing non-platform-dependent code (business logic libraries) in Swift would thus not be wise. However, writing platform-dependent code in it (interface related for example) would be perfectly fine. Not to say it would be a good idea, however it is definitely an interest. Add a .m file to your class, and name it CustomObject.m. If you did not see the prompt, or accidentally deleted your bridging header, add a new .h file to your project and name it <#YourProjectName#>-Bridging-Header.h. Add another .h file and name it CustomObject.h. There is no need to import explicitly; that's what the bridging header is for. Add a .swift file to your project, and name it MySwiftObject.swift. var someProperty: AnyObject = "Some Initializer Val"
var returnVal = "You sent me \(someArg)"
The file:<#YourProjectName#>-Swift.h should already be created automatically in your project, even if you can not see it. 1. CodeCompletion wasn't behaving as accurately as I'd like it to. On my system, running a quick build with "cmd + r" seemed to help Swift find some of the Objective-C code and vice versa. 2. If you add a .swift file to an older project and get error: dyld: Library not loaded: @rpath/libswift_stdlib_core.dylib, try completely restarting Xcode. 3. While it was originally possible to use pure Swift classes in Objective-C by using the @objc prefix, after Swift 2.0, this is no longer possible. See edit history for original explanation. If this functionality is reenabled in future Swift versions, the answer will be updated accordingly. See Apple's guide to Using Swift with Cocoa and Objective-C. This guide covers how to use Objective-C and C code from Swift and vice versa and has recommendations for how to convert a project or mix and match Objective-C/C and Swift parts in an existing project. Xcode also does this translation on the fly — you can use Open Quickly while editing a Swift file and type an Objective-C class name, and it'll take you to a Swift-ified version of the class header. (You can also get this by cmd-clicking on an API symbol in a Swift file.) And all the API reference documentation in the iOS 8 and OS X v10.10 (Yosemite) developer libraries is visible in both Objective-C and Swift forms (e.g. UIView). A prompt appears, and then click on OK... If it does not appear, then we create it manually like in the following... Create one header file from iOS source and give the name ProjectName-Bridging-Header (example: Test-Bridging-Header), and then go to build setting in the Swift compiler code -> Objective-C bridge add Objective-C bridge name ..(Test/Test-Bridging-Header.h). Yeah, that's complete. Optionally, delete the Objective-C file you added (named "anything" in the GIF image above). You don't need it any more. Now in any Swift file you can use existing Objective-C code, in the Swift syntax (in the case of this example, and you can call Mixpanel SDK methods, etc.). You need to familiarize yourself with how Xcode translates Objective-C to Swift. Apple's guide is a quick read. Or see this answer for an incomplete summary. 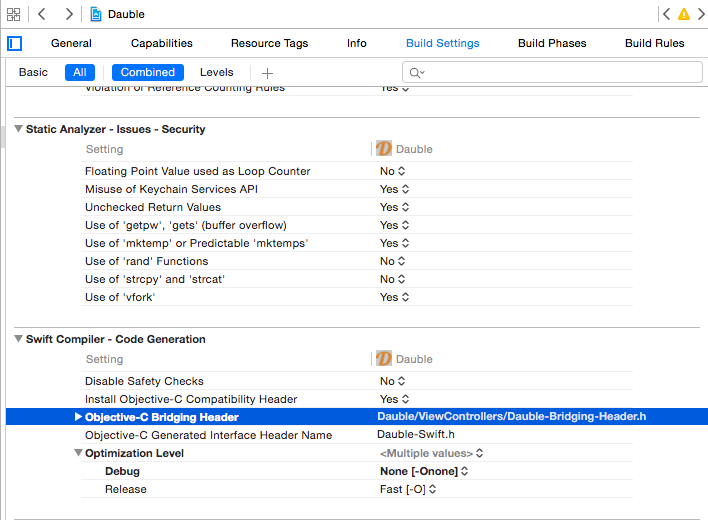 Note: If you remove the bridging header file from your project, be sure to go into Build Settings and remove the value for "Objective-C Bridging Header" under "Swift Compiler - Code Generation". You can read the nice post Swift & Cocoapods. Basically, we need to create a bridging header file and put all Objective-C headers there. And then we need to reference it from our build settings. After that, we can use the Objective-C code. Also have a look at Apple's document Using Swift with Cocoa and Objective-C as well. In particular, the example calls an Objective-C and a C++ function from the Swift. The key is to create a shared header, Project-Bridging-Header.h, and put the Objective-C headers there. Please download the project as a complete example. This import makes all of the Foundation APIs—including NSDate, NSURL, NSMutableData, and all of their methods, properties, and categories—directly available in Swift. I am very thankful for @Logan's answer. It helps a lot to create a bridge file and setups. But after doing all these steps I'm still not getting an Objective-C class in Swift. I used the cocoapods library and integrated it into my project. Which is pod "pop". So if you are using Objective-C pods in Swift then there may be a chance that you can not able to get or import the classes into Swift. Use clang import when #import is not working. Just a note for whoever is trying to add an Objective-C library to Swift: You should add -ObjC in Build Settings -> Linking -> Other Linker Flags. After you created a Bridging header, go to Build Setting => Search for "Objective-C Bridging Header". Just below you will find the ""Objective-C Generated Interface Header Name" file. Import that file in your view controller. Example: In my case: "Dauble-Swift.h"
Click on the New file menu, and chose file select language Objective. At that time it automatically generates a "Objective-C Bridging Header" file that is used to define some class name. "Objective-C Bridging Header" under "Swift Compiler - Code Generation". Then save the name of file Your_Target_Name-Bridging-Header.h People here gets common mistake by taking their project name but it should be the Project's Target's name if in case both are different, generally they are same. Then in build settings search for Objective-C Bridging Header flag and put the address of your newly created bridging file, you can do it right click on the file -> show in finder -> drag the file in the text area then the address will be populated. In the swift file you can access the ObjC file but in swift language only. I have added the project on github that include small sample to call objective c code from swift. In the Swift 4.2.1 project in Xcode 10.1 you can easily add Objective-C file. Follow the steps below to bridge Objective-C file to Swift project. File > New > Project > objc. File > New > File... > macOS > Objective-C File. Would you like to configure an Objective-C bridging header? Build Settings > Objective-C Bridging Header > Objc-Bridging-Header.h. Step_07: Drag-and-drop your Objc-Bridging-Header.h into that box to generate a file path. 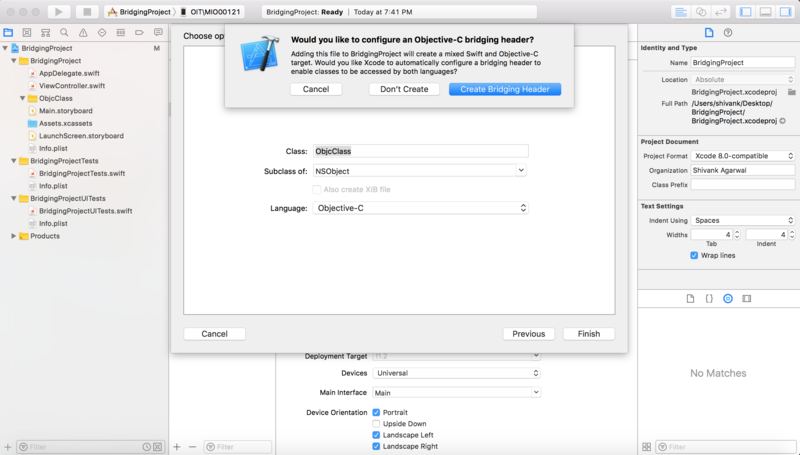 Step_08: Open your Objc-Bridging-Header.h file and import the Objective-C file which you want to use in your Swift file. To import a set of Objective-C files into Swift code within the same app target, you rely on an Objective-C bridging header file to expose those files to Swift. Xcode offers to create this header when you add a Swift file to an existing Objective-C app, or an Objective-C file to an existing Swift app. In your Objective-C bridging header, import every Objective-C header you want to expose to Swift. In Build Settings, in Swift Compiler - Code Generation, make sure the Objective-C Bridging Header build setting has a path to the bridging header file. The path should be relative to your project, similar to the way your Info.plist path is specified in Build Settings. In most cases, you won't need to modify this setting. Any public Objective-C headers listed in the bridging header are visible to Swift. Set path of bridge-Header in Build settings. Not the answer you're looking for? Browse other questions tagged objective-c swift or ask your own question. Can we use swift along with objective - c in Xcode 6 beta? How to work on two UIViewControllers one in swift and other in objective-c..? how to use the objective c framework class in swift project? What's the syntax of an Objective-C CLASS (vs INSTANTIATED) method call within Swift? Why is Swift compile time so slow?